The narrative seems to go absolutely nowhere from start to finish, says S Saraswathi. Vincent Selva's 2005 supernatural thriller Jithan, starring producer RB Choudary's son Ramesh, was the surprise hit of the year. The film did so well that it earned its debutant actor, the tag 'Jithan Ramesh'. A remake of the Hindi film Gayab, Jithan was penned by Ram Gopal Varma. Its sequel has been written Vincent Selva, and directed by newcomer Rahul. Except for the very brief and pathetic opening scene, which attempts to connect the sequel to the first part, there is nothing in the film even remotely associated with the original entertaining film. Ramesh continues to play the timid and bullied Surya, while Srushti Dange has been roped in to play the female lead. 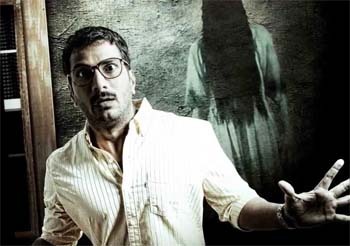 The film revolves around Surya’s adventures in a haunted house. Painfully slow, drab and immature, this horror comedy has you yawning right from the start. The narrative remains stagnant for most part, meandering aimlessly evoking neither fear, nor laughter. The film is just a series of mundane flashbacks and an uninspired climax. Suryabarely sets foot into his new house in Kodaikanal when his troubles begin. An eerie presence in the house is determined to drive him out. There are bizarre dark shadows, lights flicker, doors bang shut, and stuffed toys and furniture have a life of their own. Though terrified, Surya refuses to budge. Purchasing a house was the dying wish of his father, and Surya is willing to take his chances with the ghost in the house. The second half of the film reveals the mystery behind the evil presence in house. Ordinary computer graphics takes care of Srushti Dange’s part in the first half, in which she appears as faceless black creepy shadows, whereas in the second half, dressed in a white designer gown, she appears more as a pretty angel rather than a ghost. Comedy has always been a huge draw in Tamil cinema but despite the presence of Karunas, Mayilsamy and Robo Shankar, who appear at brief intervals, there is little humour in the ridiculous antics of the characters. Jithan Ramesh, who has a meaty role, unfortunately has a blank expression throughout, irrespective of what the scene demands. Music by Srikanth Deva is average, the background score is too loud and jarring. The film could have been shortened by a good 30 minutes; the narrative seems to go absolutely nowhere from start to finish. Sluggish for most part with a lame plot and uninspired direction coupled withpoor performances, ordinary music and an overdose of hackneyed computer graphics, Jithan 2 is an utter waste of time.